Purify all drinking water by heating to a rolling boil, purifying crystals or a water filter. Hang all food, garbage and other scented items (i.e. toothpaste) in a pack from a tree, or a rope between two trees, at least 13 feet off the ground and 4 feet from the nearest tree trunk…. remember bears can swim from island to island! If there are no trees in the vicinity, lock your food in the bow or stern hatch of your sea kayak. Garbage…Try to pack out more than you pack in! Remove your garbage as well as any you find on your site. There are no designated washroom sites on Georgian Bay…. when you are caught with your pants down; move 60 meters from shore, dig a 6” hole and use as little toilet paper as possible. There are no designated campsites on the Bay, please try to use existing sites rather than creating a new one…ask us where some of the best ones are! Northern Georgian Bay and the Killarney coast is a land of rugged wilderness and solitude. It is a magical area and Group of Seven vistas in every direction. There are; however, important issues to keep in mind. Waves and wind on Georgian Bay can build up in a matter of minutes and overturn a kayak. Know your skill limit on the water and seek shelter when necessary. Always carry extra rations, clothes, the proper safety gear, first aid kit, and knowledge to use it. Advise a contact person before you leave of your whereabouts and trip itinerary, or leave one with us. Furthermore, it is advisable to travel with skilled sea kayakers and be part of a group. Become proficient at navigation and weather interpretation before your bow hits the water. You or someone in your group should carry a marine radio, cell phone, GPS or similar equipment. A detailed five day forecast can be retrieved from the Sudbury Airport at 705 677 7928. The internet hosts numerous weather sites, including the Environment Canada Great Lakes Marine Forecast at www.weatheroffice.ec.gc.ca on your marine radio, channel 16 is used for emergencies. Also, 911 will work on a cell phone. 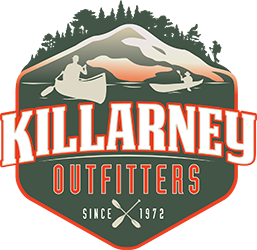 Contact us; we are more than happy to provide any assistance you need for a fantastic kayak trip in Killarney. Please enjoy Killarney and respect the wilderness that lies herein. After your trip, visit the village of Killarney for shopping, scenic cruises of Georgian Bay, or perhaps a delicious homemade meal. If you have any questions feel free to contact us and we will be happy to assist you. A Paddler’s Guide to Killarney and the French River by Kevin Callan (2006), Kevin Callan's guidebook provides the 20 best canoeing, kayaking, and hiking trips in Ontario's picturesque Killarney/French River region, a favourite wilderness getaway spot in central Ontario.